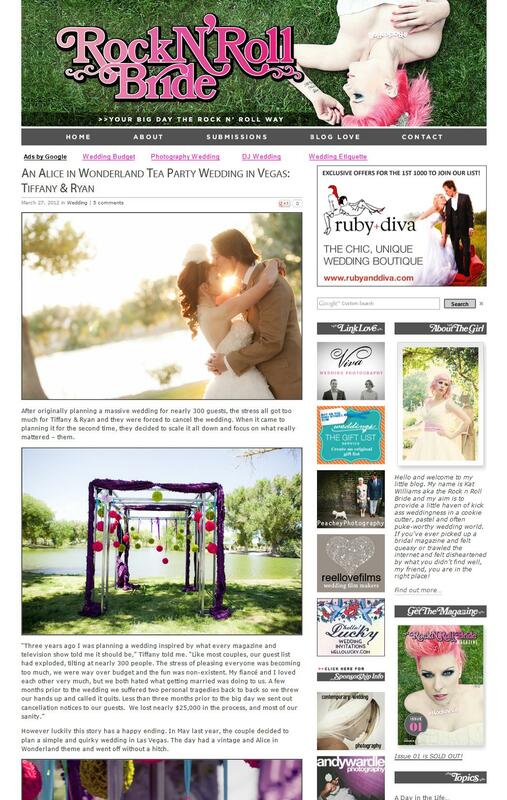 Tiffany and Ryan's wedding has been featured on Rock N' Roll Bride! This is our second time on Rock N' Roll Bride and we are thrilled! Check out our styled shoot that was featured on Rock N' Roll Bride in 2010. Tiffany and Ryan had an Alice in Wonderland inspired wedding at a local park in Las Vegas. I loved the bright colors, Tiffany's adorable mini top hat and tea length dress, and their gorgeous photos of course. Head over to Rock N' Roll Bride to check out the story and the rest of the photos.